What do you do when your outspoken, passionate, and quick-witted mother starts fading into a forgetful, fearful woman? In this powerful graphic memoir, Sarah Leavitt reveals how Alzheimer’s disease transformed her mother Midge—and her family—forever. In spare black and white drawings and clear, candid prose, Sarah shares her family’s journey through a harrowing range of emotions—shock, denial, hope, anger, frustration—all the while learning to cope, and managing to find moments of happiness. Midge, a Harvard-educated intellectual, struggles to comprehend the simplest words; Sarah’s father Rob slowly adapts to his new role as full-time caretaker, but still finds time for word-play and poetry with his wife; Sarah and her sister Hannah argue, laugh, and grieve together as they join forces to help Midge get to sleep, rage about family friends who have disappeared, or collapse in tears at the end of a heartbreaking day. 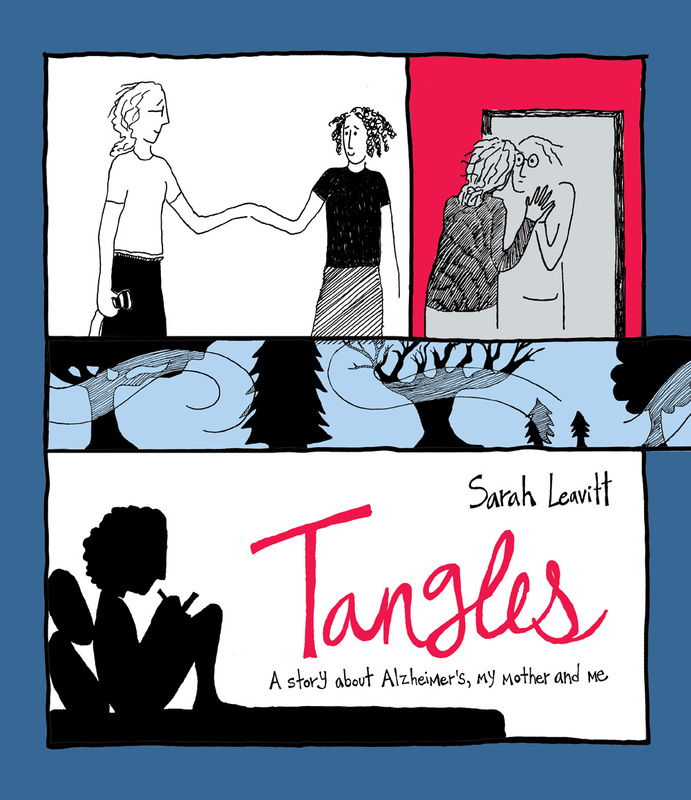 Tangles confronts the complexity of Alzheimer’s disease, and gradually opens a knot of moments, memories, and dreams to reveal a bond between a mother and a daughter that will never come apart. Sarah Leavitt writes both prose and comics. Her writing has appeared in Geist, The Globe and Mail, Vancouver Review, The Georgia Straight, and Xtra West. Leavitt has written short documentaries for Definitely Not the Opera on CBC Radio, and her non-fiction has appeared in a number of anthologies, including Nobody’s Mother (Heritage 2006) and Beyond Forgetting: Poetry and Prose about Alzheimer’s Disease (Kent State University Press 2009). She has an MFA in Creative Writing from UBC. Tangles is her first book. This entry was posted in 2010 Releases, Press Releases, Publishers by Jason Truong. Bookmark the permalink. This is my first graphic novel! I read two reviews in major newspapers and Googled and found your review and finally took the plunge. This book was like watching a film and reading a book at the same time. I really enjoyed her spare drawings and restrained writing style. No flourishes to push me out of the story. I wept and laughed. Tangles is a fine work and I recommend it for everyone. That’s great to hear, Sara, I’m glad you enjoyed the experience of reading your first graphic novel. Tangles is the third book recently released by a female Canadian cartoonist who decided to create a graphic novel. The other two are Spot 12 by Jennie Jaeckel, who created and self published the book, and Tyranny, by Lesley Fairfield, published by Tundra Books. We are very fortunate to have so many personal stories being told by first time female creators, and it reinforces the comic renaissance that is occurring today.